Belize City, Belize – September 7, 2016 – Today, the Belize Tourism Board (BTB) held a ceremony to congratulate and award the representatives and winners of the Florida Caribbean Cruise Association’s (FCCA) annual poster and essay competitions. Present for the handing over to each student and their schools were the Minister of Tourism and Civil Aviation, Hon. Manuel Heredia Jr., and the Director of Destination Planning & Cruise, Noriko Gamero. The competitions were conducted in two categories: Juniors ages 12 and under, and Seniors ages 13-16. 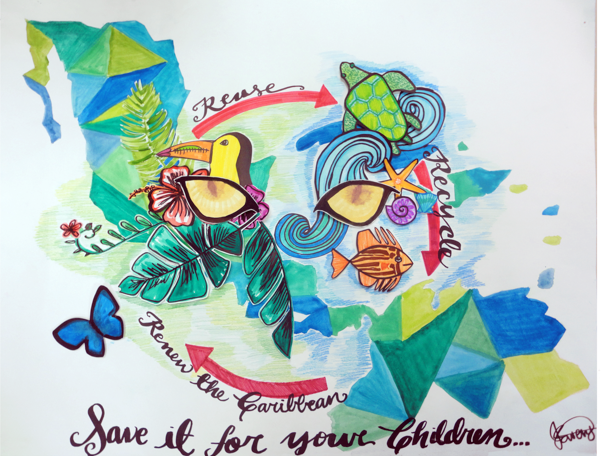 The poster competition was based on the theme, “Reuse, Recycle …Renew the Caribbean,” and was intended to promote and encourage environmental awareness amongst students throughout the Caribbean, and at the same time, effectively enlighten the younger generation on the significance of environmental Protection. Jaqueline Ewens, of Belmopan Methodist School, proudly represented Belize in the Senior Division. She was awarded US$200 for her participation. Daniel Peraza, of Holy Angels R.C. School, placed third overall in the Junior Division. Both Daniel and the Holy Engels R.C. School received US$1,000 each. The Essay Competition was based on the theme, “If you were a cruise passenger, what would you want to see and do in your destination?” Ryan Smith, of Grace Primary School, proudly represented Belize in the Senior Division. He was awarded US$200 for his participation. We are proud to announce that Janae Rodriguez, of St. Ann Anglican Primary School, placed first overall in the Junior Division. She has been invited to accept her cash scholarship of US$3,000 as well as a monetary award of US$3,000 for her school, at the opening ceremony of the 2016 FCCA Caribbean Cruise Conference, taking place on September 27, 2016 in San Juan, Puerto Rico. Janae wrote an extraordinary essay which takes the reader through various sights and adventures of Belize, including the Community Baboon Sanctuary, zip lining through the forest, cave tubing, an airboat tour, a stop at the Old Belize museum, and ending with a swim with sharks and sting rays. The BTB wishes to thank all students who participated in both the poster and essay competitions. It was certainly a tough task to narrow down the representatives for Belize, as they were all incredible. We look forward to next year’s competitions.